Creative Holiday Gifts for your little artist is here! Struggling to find the perfect gift for the little artist in your life? These amazing gift ideas for your little artist will make your holiday shopping a breeze this year. Rock Painting Guide’s top 12 amazing gift ideas for your budding artist. Enjoy! ALEX Art Studio Acrylic Painting Set – 24-piece acrylic paint set perfect for budding artist. Cedar Markers Liquid Chalk Markers – 12 pack, Beautiful neon colors, reversible tips, and easy clean up. #1 Best Seller on Amazon! Paint Stencils – 180 pack of easy to stick down and reusable paint stencils. 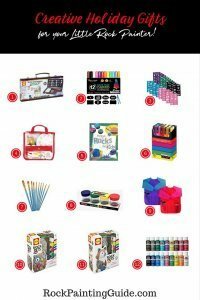 Faber-Castell Young Artist Learn to Paint Set – Popular paint set for ages 5 and up. Washable paint included. Painting on Rocks for Kids Book – Easy-to-follow guide with amazing designs for kids. Uni-posca Paint Marker Pens – Medium point, set of 15 colors. It dries fast and is waterproof. Heartybay 10 Piece Round Pointed Tip Brush Set – #1 Best Seller on Amazon! Melissa & Doug Spill Proof Paint Cups – Set of 4, Pour paint in and keep it fresh for the next art session. Dreampark 2 Pack Children Art Smock – Waterproof Long Sleeve with 3 pockets. Suitable for ages 2-6 years old. ALEX Craft Rock Pets Owl – Includes 1 owl rock pet, 6 weatherproof paints and a brush. Suitable for 8 years and older. ALEX Craft Rock Pets Fox -Includes 1 fox rock pet, 6 weatherproof paints, and a brush. Suitable for 8 years and older. Apple Barrel Acrylic Paint Set – 18 fantastic paint colors glide on smoothly, dries quickly and cleans up easily with soap and water.